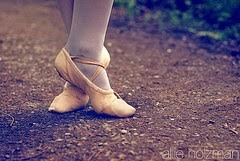 Taking care of your body is an important part of being a dancer, and taking care of your feet is a good place to start. When I am feeling a bit ethereal about such things, I talk about dance in terms of your relationship to the floor. Much of our basic movement vocabulary can be explained, or at least better understood in terms of where the weight is borne through the feet, or the force exerted (or not) when a part of the foot is pressed into the floor. At an intermediate level dancers learn to separate their hip movement from their feet, in order to layer and travel freely, but at a grass roots level, hip lifts, figure 8s, even camels can be broken down to the way your feet interact with the floor. Many beginner bellydancers are advised to dance barefoot. The constriction of the feet (especially at the toes) by shoes affects your basic posture, and the ability to freely flex your foot and feel the floor can be very helpful. Good foot placement and weight distribution is literally the foundation of good posture. Get it right and the knock on effect protects your ankles, knees, back and even your neck while you dance. It is also the cheapest option, as beginning dancers often don't want to invest in specialist shoes. Many dancers choose to remain barefoot for all of their training and performances. Barefoot is a healthy way to be, I rarely wear any footwear around the house. I find that the exercise barefoot walking gives my feet keeps them strong, and stops my flexible arches from falling. So why wear shoes to dance? It seems to be a common misconception that it is somehow "authentic" to bellydance barefoot. This is quite untrue. Dancing with dirty feet (and they are bound to become dirty) is very much frowned upon, and although it is not unheard of to dance barefoot, shoes are generally worn by dancers in the Middle East. Baring the sole of the foot deliberately "at" someone is an offensive gesture in the Arab world, although an accidentally visible sole mid-dance is unlikely to offend. A few years back I was in a workshop taught by one of the great matriarchs of Egyptian dance, a fierce and formidable lady, she had a very angry rant about Western dancers assuming that it was authentic to dance barefoot. Her offence at how we "assumed" that her people were some kind of "barefoot primitives" was made clear to us all! In a Western setting, unless you are dancing for an Arab audience (or instructor! ), you are unlikely to bother anyone else by being barefoot. It would be fabulous if every dance space we used, for class, practice and performance as a lovely clean, polished sprung wood floor, but that's never going to happen. Sometimes we dance outside, sometimes in restaurants with dirty floors and possible shards of broken glass or crockery, so we need to protect our feet. In my dance career I have trodden on thistles, glass and broken a toe mid-performance when it caught in an uneven surface. Even a small cut can seriously effect your ability to bear weight evenly on your foot, if it becomes inflamed and sore, and that is going to inhibit your ability to dance for several days. A small injury on the sole of your foot can also affect how you bear your weight, causing knock-on effects on your posture and damage to your ankle, knee or back. Sometimes it's not the state of the floor, but the floor itself. Dancing barefoot on carpet can make turns treacherous, as the grip wrenches your knees and the friction can literally tear your skin apart. Equally some dance studios have very slippy floors and good dance shoes will give you that extra purchase you need to keep you on your feet. When you are in costume, just as much as out, your footwear is part of your outfit. Glitsy shoes can finish your look and many dancers wear some variant of high heels when they are performing. Wearing heels also adjusts your centre of gravity and posture, which in turn alters the overall style of your dancing. Below is a summary of some of the most common shoes worn by bellydancers. All dancers have their own preferences, and may wear different shoes for different circumstances. I've tried to put some pros and cons for each type, but this is based on my own experience, your mileage may vary. There are several different types of shoes that might fit into this category. Standard ballet shoes, from dance suppliers are usually split sole, that is they have a hard leather pad on the toe and another on the heel. Some have a single sole, that runs the length of the foot. These tend to be a tight fit. Personally I find the small sole (which is far narrower than my foot) unstable, and the narrow toe does not allow me to spread my toes into a stable base. You can also get soft soled dance shoes, and many bellydance suppliers sell something similar with added bling. These are a great budget option for beginning dancers, they work well with costumes and protect the feet without restricting them too much. On the other hand they aren't very supportive and the sole is no good for outdoor performance. They do wear out, but they'll last long enough and they aren't too pricey to replace. I keep an old pair of these for performing on surfaces I don't really want to subject my more expensive shoes to. For performance, or even class, you could try a soft pair of the ballet flats that are now commonly sold for fashion purposes. They often come in sparkly or decorated versions and they can be quite cheap. An advantage with these is that they have a good sole for outside the studio or stage. Decorated slippers of various other kinds are also available, beaded slippers from Egypt or India are a common choice. Make sure they are a good fit, and practice in them, properly, before you try and perform in them. If you like the barefoot feeling, but would like to improve your traction on the floor for smooth spins and perhaps protect your feet a little, dance paws are an excellent option. They come in full foot options, that have a light suede sole on the ball of the foot and the heel, or a half foot option that only covers the ball. There are various designs but generally the toes are left free and the pads are held in place with mesh fabric, like a partial sock, or straps. They are usually flesh coloured, to give the illusion of dancing barefoot, although some funky colourways are now available, including prints, mehndi patterns and diamanté. In my experience, dance paws are a consumable piece of kit. Over time, sweat and use will harden the suede sole, and eventually they crack and rip, or the straps holding them in place tear. Jazz shoes offer good support for the foot, and dancers who need insoles or arch supports often wear them to train in. Generally the aesthetic isn't right for performance. My favoured shoes are actually a kind of jazz sneaker from Capezio, in a style that look more like a lyrical shoe, but a lot more durable than dance paws. I have these in flesh colour and I have added hotfix gems to them, they are subtle enough to wear on stage but very supportive. The downside is that the fabrics absorb a lot of sweat and they are not pleasant scented to say the least. I've been wearing the same pair for 2 years now and they are showing minimal wear, which has made them a worthwhile investment. This is more for performance than training, though if you perform in heels you will have to practice in them. Many dancers like the aesthetic of high heeled shoes with a sparkly costume. They work best for Oriental styles where you dance on your toes a lot regardless. They don't work for earthy styles. Wearing heels shifts your centre out of your pelvis, up and forward which compromises your gooey hipwork, but looks elegant for graceful travelling. If you are dancing in heels, it is best to buy shoes specially designed for dancing. Tango shoes are structurally spectacular, but very expensive. Character shoes are slightly less dainty looking, but more stable and less expensive. Ballroom shoes often have suede soles, which is great for dancing on clean, dance-specific floors, but if you plan to dance outside, or on a potentially dirty surface, you might want to consider something more durable. Flat sandals such as Grecian sandals or ghillies (the shoes worn by Irish dancers) are also popular amongst bellydancers for performance and training. Personally I've never felt confident enough to try a pair as you need a good shoe with a good fit for security and safety, but it's worth being aware that the option is available to you. Sometimes students in my classes want to wear socks to dance. As a point of safety I generally advise against this as socks are very slippery on the studio floor and put you at risk of injury. If you are practising at home, on carpet however, socks might be a reasonable option. Slipper socks, with grips, are sometimes suggested for those who want to dance in socks, but in general they tend to have a very sloppy fit and either the foot slides around inside them, or they start creeping off the toes. Some contemporary dancers wear socks on their toes, rolled down to allow traction on the heels smooth spins on the toes. I'm not convinced even by this option for bellydance however, especially Oriental style which involves a lot of dancing en releve where using the heel for grip is not an option. If you have poor circulation or just get cold feet when you dance, then you do need to find a way to keep your feet warm. Dancing with cold feet can lead to discomfort and injury. In this case I would suggest either wearing thin socks (or tights) with dance shoes, or wearing yoga socks, which are tight fitting, with separate toes, and have a fine, even grip pattern over the whole foot and toes. Don't wear yoga socks to dance on carpet though, it rips the grip nodules off. Another option is leg warmers, the ones that cover the instep but leave the toes and heels out. Most bellydancers experiment with different types of shoes until they find something that works for them. I have been through several shoe "phases", but ultimately your choice needs to be based upon what is comfortable and safe for you. If you don't feel confident on your feet, you are not getting the most out of your dance.